Play the music for a country song. New Mexico, the wild West for an Easterner like me. 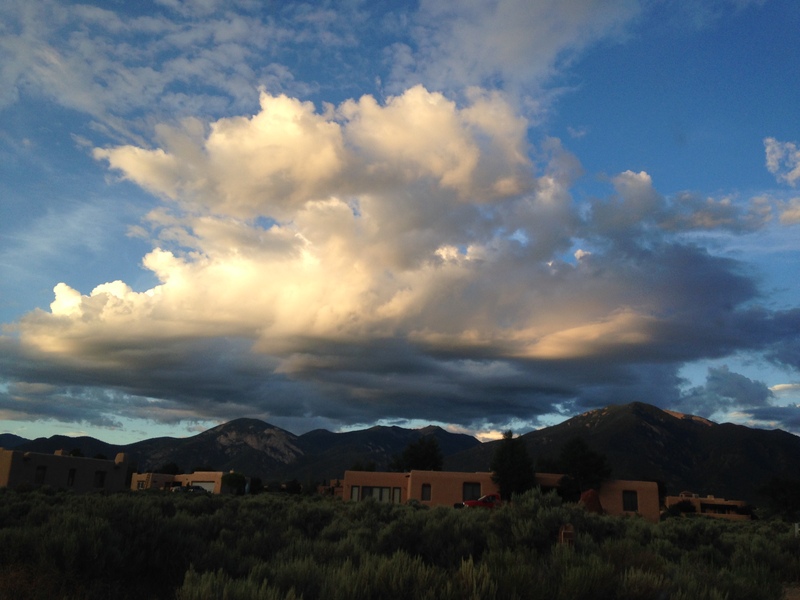 …Heaven feels near in Taos. If you don’t believe in heaven, you will believe in SOMETHING bigger than yourself when the place seeps under your skin. The smell of sage lifted and swirled by winds and the skies glowing, make you feel small and lost in the universe. Happily lost and open to finding yourself anew. “It doesn’t interest me what you do for a living. I want to know what you ache for and if you dare to dream of meeting your heart’s longing. I was asked to do the wedding flowers. Ok! said the one who is always saying, “I am here to help! How can I help? 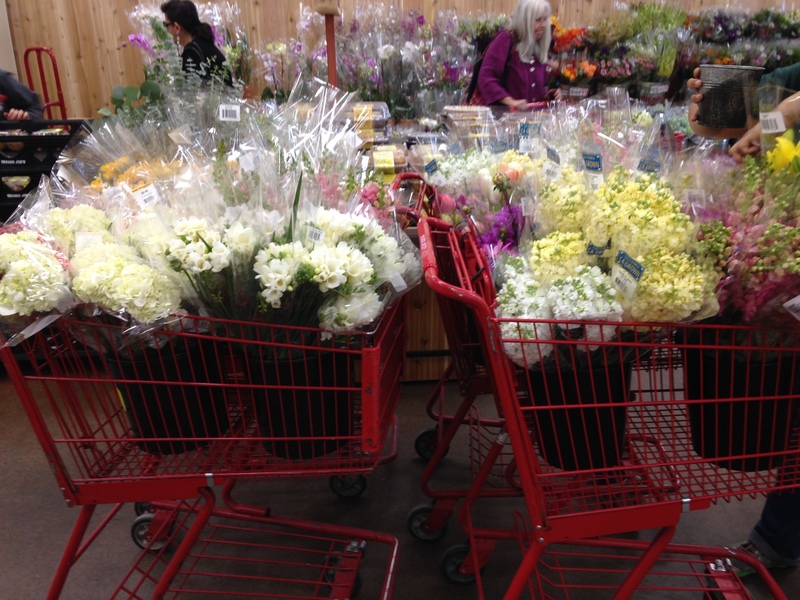 What can I do?” Driving to Santa Fe from El Prado where the wedding was to be held, at daybreak, to pick up floral order at Trader Joes, I was speechless when they wheeled out 4 grocery carts of flowers! Now it became real. 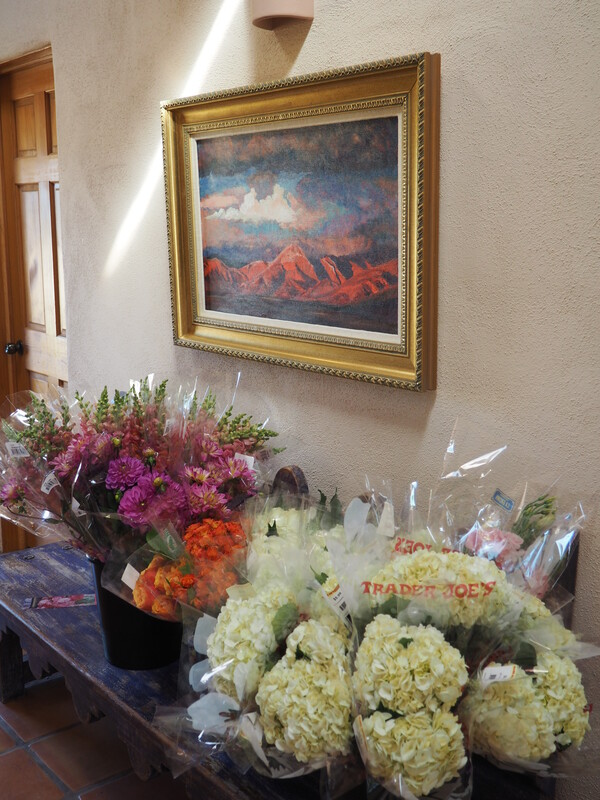 The colors the bride chose were perfect – the colors of Taos. 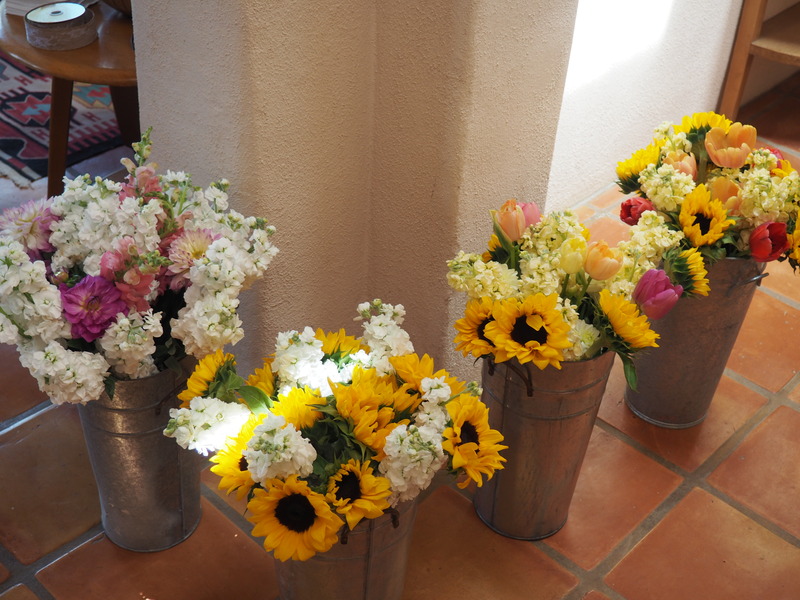 My Mother, sister, daughter and I spent the day arranging flowers for the tables, for the chairs at the ceremony, bridal bouquet and boutonnieres! 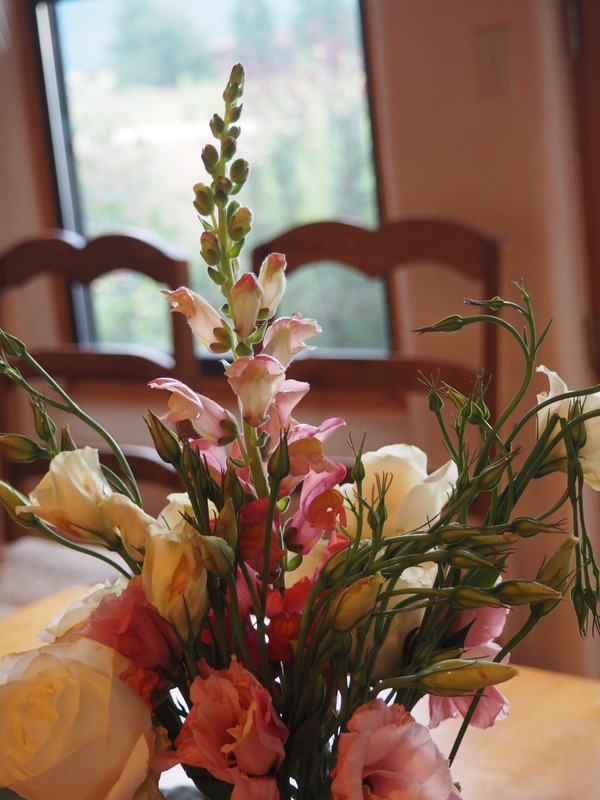 Now I see why almost every thing you read tells you not to do the wedding flowers yourself!! It was stressful, but in the end, I am so glad we did it. The tent went up, the people arrived, the ceremony was touching and beautiful …outdoors in this remarkable place. Their 15 week old black lab puppy stole the show along with the flower girl and ring bearer. …. Until the bride arrived…… and she was glorious, and so at home – yes, it was at their home – and the groom had eyes only for her. There was a question about the Brunch to be held the day after the wedding as some weddings offer, but this couple had other plans for their guests. Whatever floats your boat! 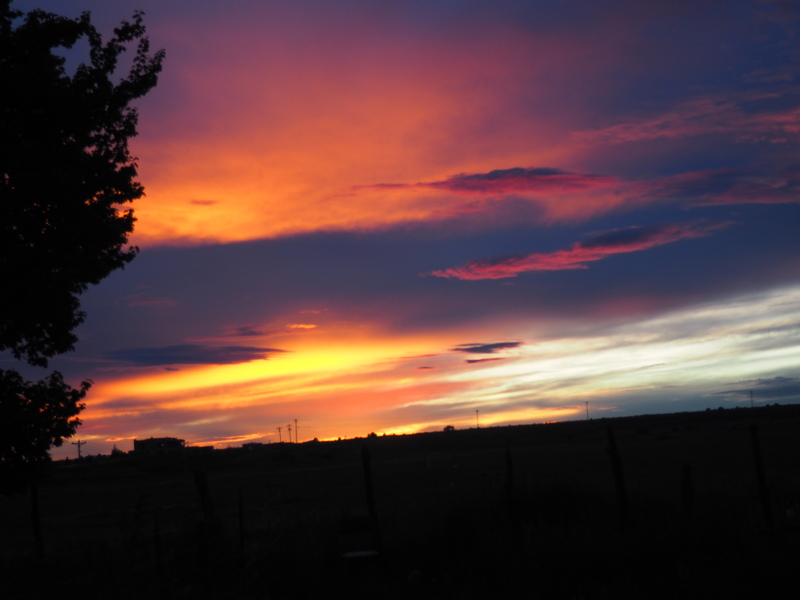 We remained in Taos and El Prado for a few more weeks where the sky was our nightly entertainment. This place, Taos, draws artists and poets and I know they can bring Taos alive for you better than I. To acquaint yourself with Taos, and get a flavor for the landscape, I recommend you read John Nichol’s “The Milagro Beanfield War.” Visit the web site of the Millicent Rogers Museum or the Georgia O’Keefe Museum. A beautiful place to be married, and a beautiful place to escape to, if you have the chance! 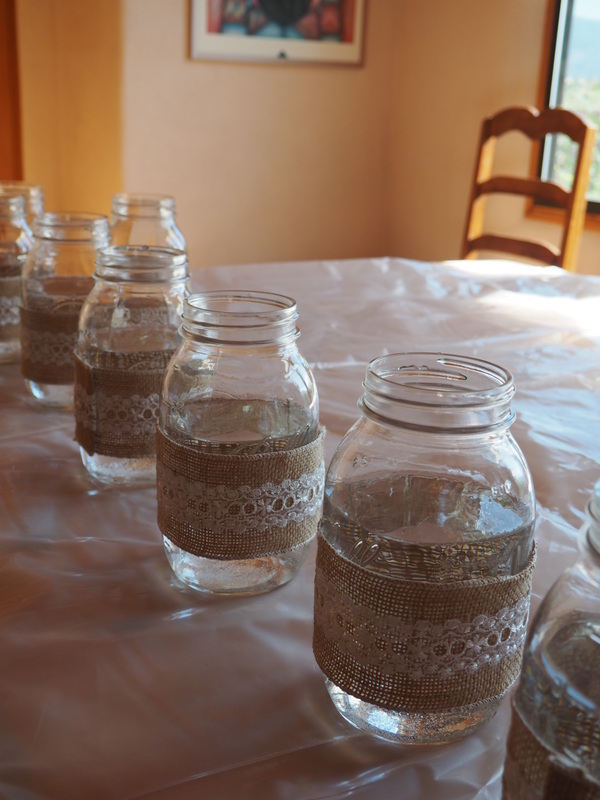 For my son and his new wife, it is a beautiful place to live and love. 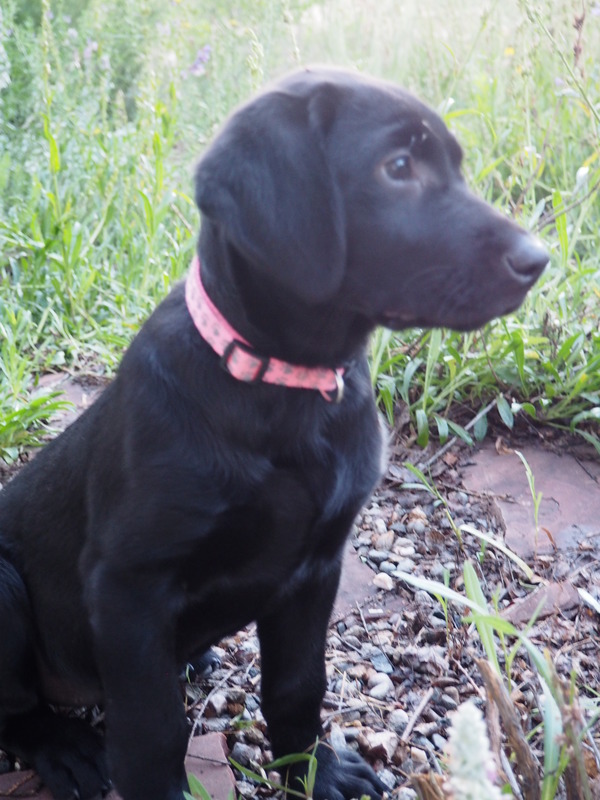 This entry was posted in Uncategorized and tagged black lab puppy, El Monte Sagrado, El Prado, El Prado NM, NM, taos NM, Taos wedding, Trader Joes, wedding flowers. Bookmark the permalink. What a beautiful wedding and an amazing setting. It looks like you and family made some amazing memories. I must visit Taos someday! 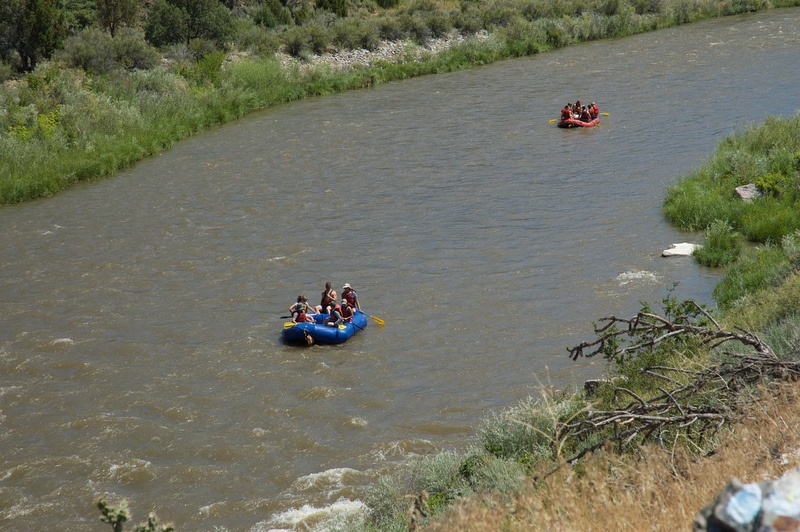 Taos and Santa Fe are both beautiful spots to visit – so different from other parts of the U.S.! It all looks wonderful Jayne and a beautiful poem too.You did a great job on the flowers. 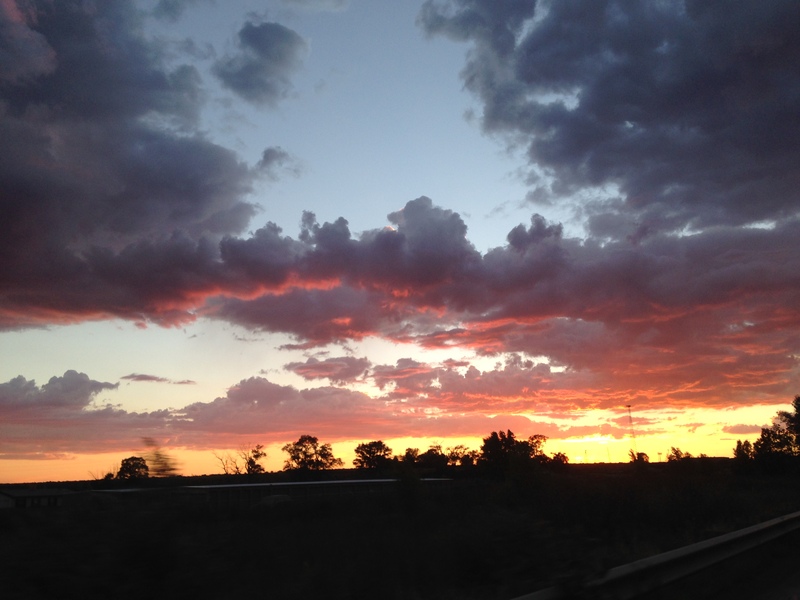 such a photographable place how lovely to live somewhere so breathtaking.